Charming, sunny modern bach with outlook to bush covered hills and large flat lawn area. Easy walk to Tongariro River - world famous Trout Fishing. Only 40 minutes drive to Whakapapa Ski Fields. 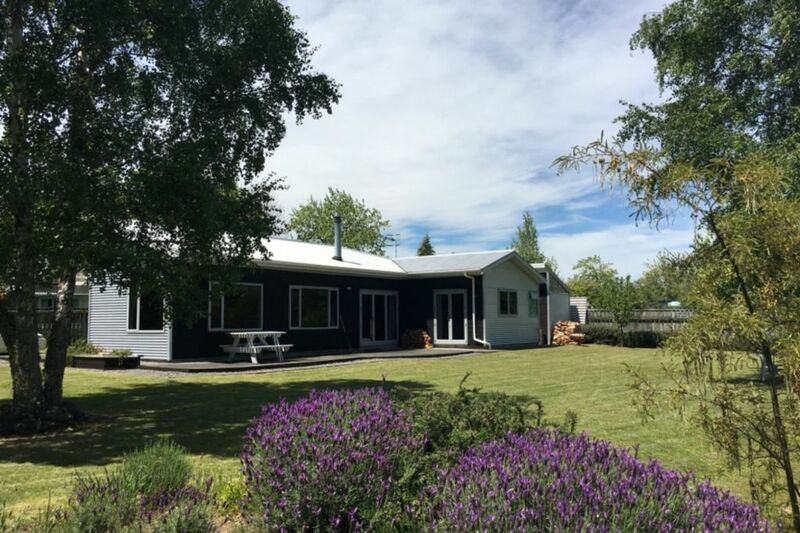 Close to The Tongariro Crossing Mountain walk and many other famous walks in the area. 30 minutes to Taupo. A few minutes drive to the very popular Tokaanu Hot Pools and geothermal area. 3 minutes drive to 18 hole golf course and mini golf. Walking distance to all services of dining out and shopping. Comes with full linen and towels. Wood burner - wood provided. Wood-burner does not have a full fire surround so not suitable for toddlers or preschool children in the winter months. Large lawn area with indoor outdoor living getting maximum sun. BBQ available on request. BBQ to be cleaned after use (cleaning fee does not cover the cleaning of the BBQ). Barbecue to be cleaned after use (cleaning fee does not cover cleaning of the Barbecue). Close to supermarket and shopping. Very enjoyable stay. Well located for the town. Internet would be a big bonus but there is good phone signal. Not keen on taking rubbish to transfer station. Generally speaking the property was reasonable. But when we first arrived there was a 'film' of some sort of slippery material over the floor in the kitchen and on the bench tops. The floor was so slippery (potentially dangerous) I had to mop the floor and wipe the bench tops down before we did anything else. The rest of the property is quite clean, however the blankets on the beds seemed quite dusty. They should probably be professionally cleaned. Communication and directions were good. Easy to pick up keys. Probably the strangest thing about the property is there are no rubbish bins. We had to dispose of our rubbish at a local transfer station. I can't imagine why bins are not supplied. The furniture in the property is quite old and dated, and mostly uncomfortable. The grounds are very well kept. I'm sure with a little more effort this property could be much better. Great location, comfortable home, had everything we needed. Would definitely stay again. The location was very good - very private and comfortable. The location was very good - very private and comfortable. Well stocked with everything we needed.